Shirt, Asos. Coat, New Look. Jeans & shoes, Topshop. I met up with my beautifully talented cousin, Kirsty, the other day to shoot this look. It's so refreshing having wonderfully developed photos to display on the blog from someone who knows what they are doing with a camera! If you are from the Nottinghamshire area and would like a portrait shoot or wedding photographer then I 100% recommend Kirsty. She will make you feel at ease, has a great eye for detail and has a true passion for what she does. It was great combining my love of fashion with her love of photography which made for the perfect collaboration. I'm not one for having a shirt on with no top button done up. Something Pinterestey inspired me with this look. 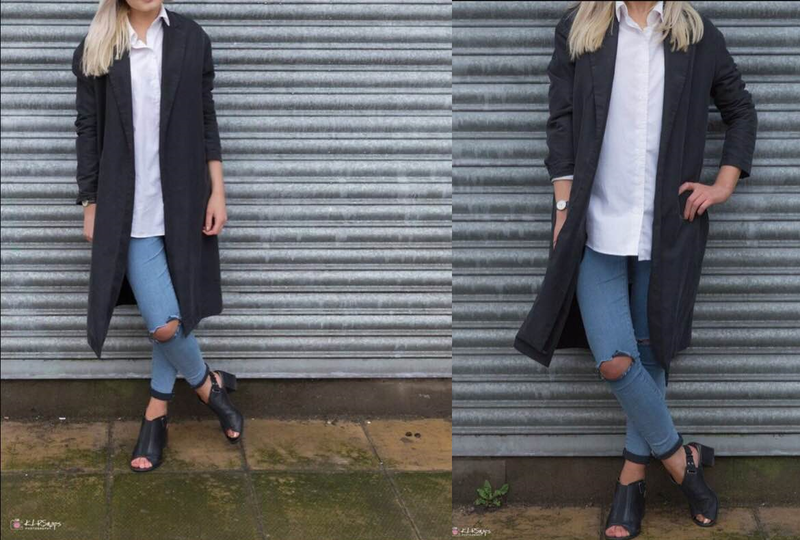 The oversized white boyfriend shirt, paired with ripped jeans and a black duster for a classic look. Minimal accessories and a staple watch. Add a fedora to the mix and even better. (It was slightly too windy on this occasion!) The look would have looked great with some Stan Smiths too. Thanks again to Kirsty for the wonderful photos!